Vintage look,following the fashion trend.It is a great gift for your boyfriend,husband,father and son. ♥SUVOM devote to give our customer best service and good products. And highly focus on all customers' feedback. ♥SUVOM pay attention to develop the brand, so any problem, please feel free to contact us by email.Will do our best for you! ♥Canvas duffle bag's size: L*W*H 22"x 9"x 12"/ 57x23x30cm 45L. It's suitable for carry-on and flight, for men and women. Perfect as a Oversize Travel Bag, Oversize Flight Bag, Weekender Bag, Gym Tote Bag, Sport Overnight Travel Bag, Sport Duffel Bag, Military Bag, Travel Duffle Bags, Shoulder Handbag. ♥Canvas and leather duffle bag Material : Made of 100% thick cotton canvas + genuine top crazy horse leather. Durable , wearable and good heat resistance. For real crazy horse leather : the longer you use , the polisher it will become! ♥Comfortable carry on luggage : Duffle bag for men with shoulder strap, easy to carry , make it comfortable and easy to wear cross body or on your shoulder during the trip. Two solid carry handles on both sides , allow carried by two people easily if the bag is too heavy. 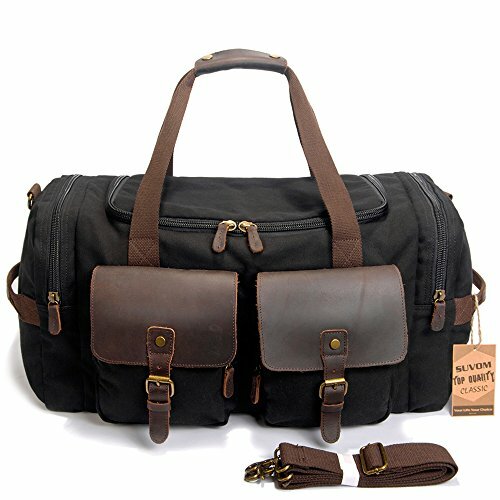 ♥Multiple pockets duffle bags for men : Interior with 1 * large main compartment up to hold 17" laptop , Ipad air , daily essentials like clothes , shoes , etc; 1 * zipper pocket ; 2 * small pockets for cell phone or coin ; Exterior with 2 * side zipper pockets ; 2 * front zipper pockets and 1 * back zipper pocket. ♥Oversized mens overnight travel bag's Features : 2 zippers pockets on each side used to expend the capacity of the luggage bag ; adjustable , removable shoulder strap has really nice metal buckle on each end that hook to metal hoops on the bag as well ( NEVER BROKEN ! ) ; The zips are all large zipper , which are smooth to pull ! And the buckles are made of classical bronze tone hardware. If you have any questions about this product by SUVOM, contact us by completing and submitting the form below. If you are looking for a specif part number, please include it with your message.